This book aims to guide the reader through preparing for and competing at their first event. Advice is given on making a critical assessment for a horse, and evaluating its strengths and weaknesses as a potential event horse. 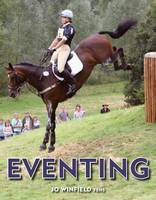 The book covers how to build on what your horse is naturally capable of achieving, with a view to putting together a suitable training plan for all phases of eventing. This entry was posted in News by Hilary. Bookmark the permalink.